**** SPECIAL 10TH ANNIVERSARY PACKAGE. BUY BOTH APRIL 12 AND 13 SHOWS TOGETHER FOR ONLY $38. APRIL 12: HYPOCRISY, FLESHGOD APOCALYPSE, AENIMUS, OBSIDIAN, BLACKWATER BURIAL. APRIL 13: ARCHSPIRE, GROSS MISCONDUCT, DEAD ASYLUM, PYRAMIDION, TORREFY. 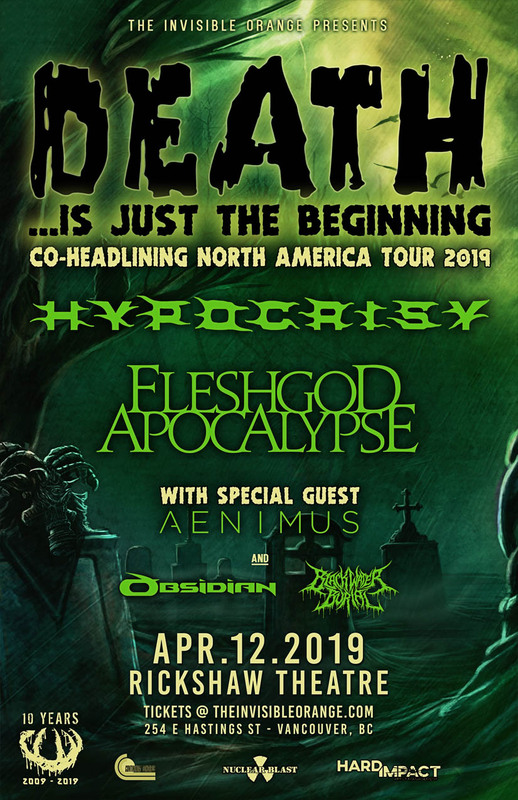 Legendary Swedish deathsters HYPOCRISY and Italian symphonic death metallers FLESHGOD APOCALYPSE, will return to North America for a co-headlining tour this March/April. Joining them are progressive, extreme metal band AENIMUS. Local support from OBSIDIAN and BLACKWATER BURIAL. The inception of HYPOCRISY dates back to 1992, when the combo signed its first contract with Nuclear Blast Records and released its monumental debut Penetralia. The follow-up Osculum Obscenum (1993) marked another milestone in the history of crushing extreme death metal, before The Fourth Dimension (1994) and Abducted (1996) broadened the band’s horizon with increasingly experimental influences, which brought them the reputation as one of Europe’s most innovative and important names in death metal. Eventually, 2002’s release of Catch 22 defined a totally different dimension of sound, vaulting the band into a new era of contemporary death metal. Being on a par with their 90’s brute yet multifaceted masterpieces the bands latest release, End Of Disclosure, leaves no room for breathers. “This time I wanted to go back to basics,” commented Tägtgren. “I felt like we lost it for the last couple of albums. This one is straight to the point and more HYPOCRISY than ever! Fast, heavy, and epic.” End of Disclosure was produced by mastermind Peter Tägtgren in his Abyss Studios in Sweden, with artwork done this time by Wes Benscoter (SLAYER, KREATOR, NILE, VADER, BLOODBATH). Claiming HYPOCRISY have outdone themselves on their new opus is a bold understatement. End Of Disclosure embodies death metal perfection! FLESHGOD APOCALYPSE are currently in the studio with legendary producer Jacob Hansen (VOLBEAT, DESTRUCTION, ABORTED, EPICA), recording the follow up to their critically acclaimed 2016 release, King. The as-of-yet-untitled-record is tentatively scheduled for a spring 2019 release. AENIMUS hail from the San Francisco, Bay Area. In August of 2013, they released their debut full length album,Transcend Reality. The following years were spent touring in support of the album with the likes of RINGS OF SATURN, I DECLARE WAR, and ARSONISTS GET ALL THE GIRLS to name a few. Following this relentless tour cycle, the band focused the next 2 years crafting their upcoming album, Dreamcatcher. Stay tuned for more information on their sophomore album!